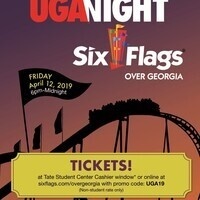 UGA Night at Six Flags returns for 2019 — join UGA Students, Faculty, Staff, Alumni and friends for a night at Six Flags. Tickets must be purchased through the Tate Cashier Office to receive student pricing. More event information available on Facebook & the Center for Student Activities and Involvement website.